”This is a motion picture of the last survivor’s eyewitness account of the Earth/Martian Apocalypse that took place in the year 1900. The material for the film was found in 2006 in film canisters, which had remained unopened for 41 years. 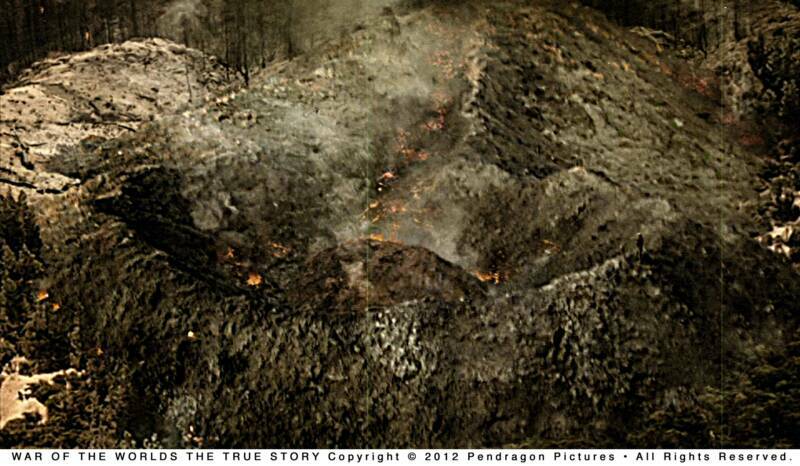 Additional material of the Earth/Mars War was provided from recently declassified combat, newspapers and newsreels. 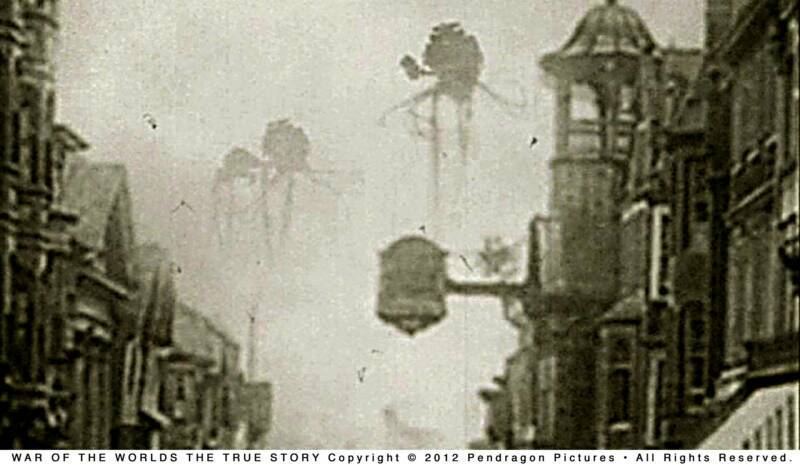 [WTF] Insane ‘War of the Worlds The True Story’ Retells History! 'War of the Worlds: The True Story' is an inventive mock sci-fi docudrama with the conceit that H.G. Wells' 'The War of the Worlds' is a true story. December 18, 2012, 5:00 a.m.
What if the Earth/Mars battle from H.G. Wells' classic novel "The War of the Worlds" wasn't fiction but actually fact? 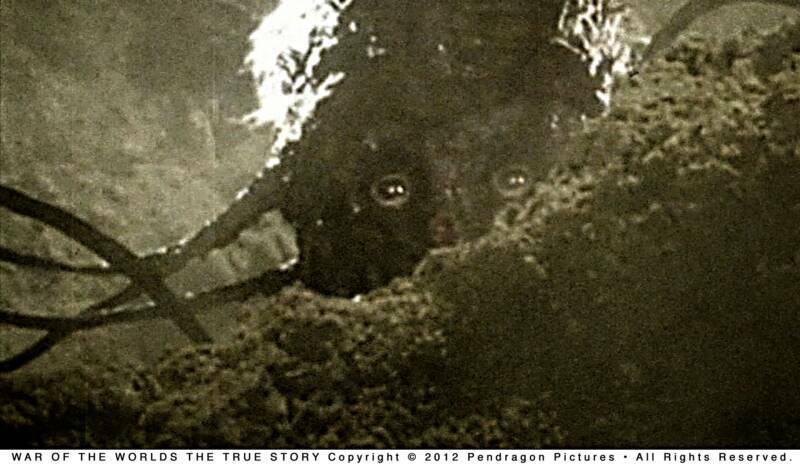 That's the conceit behind the hugely inventive and ambitious concoction "War of the Worlds: The True Story," a mock sci-fi docudrama packed with a truly impressive — and clever — mix of editing (a reported 3 1/2 years' worth), special effects, visual artistry and offbeat storytelling. Director-editor Timothy Hines (he also co-wrote with producer and cast member Susan Goforth) sets his provocative tale around a supposed found-footage interview, "originally" shot in 1965, with 86-year-old Englishman Bertie Wells (Floyd Reichman), the last living eyewitness to the turn-of-the-century Martian Apocalypse. 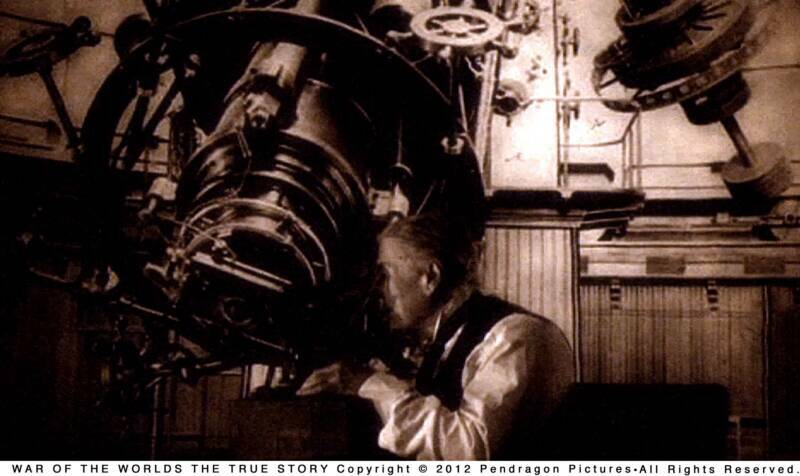 Images and details revealed in the new War Of The Worlds The True Story TV Spot. A new TV spot for WAR OF THE WORLDS THE TRUE STORY has been released online, featuring never-before-seen footage. The movie, WAR OF THE WORLDS THE TRUE STORY opened with a successful world premiere in Seattle June 14, 2012 and is now playing in select theatres. 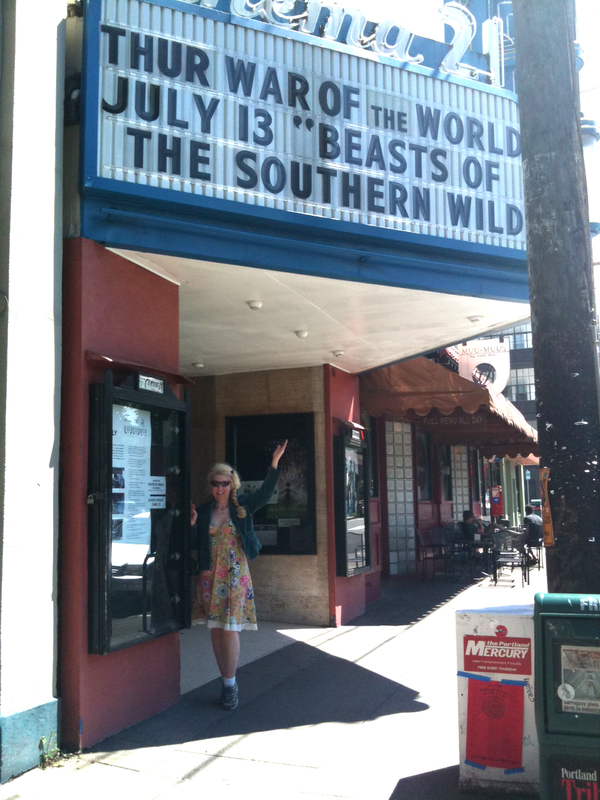 Next up, the movie plays in Portland OR at Cinema 21 on June 21-22 and the Hollywood Theatre on June 23-24, at the Mount Baker Theatre in Bellingham WA on June 22, and at The Crest Theatre in Sacramento, CA on July 7. The Martians next invade more California cities, Arizona and New Mexico. 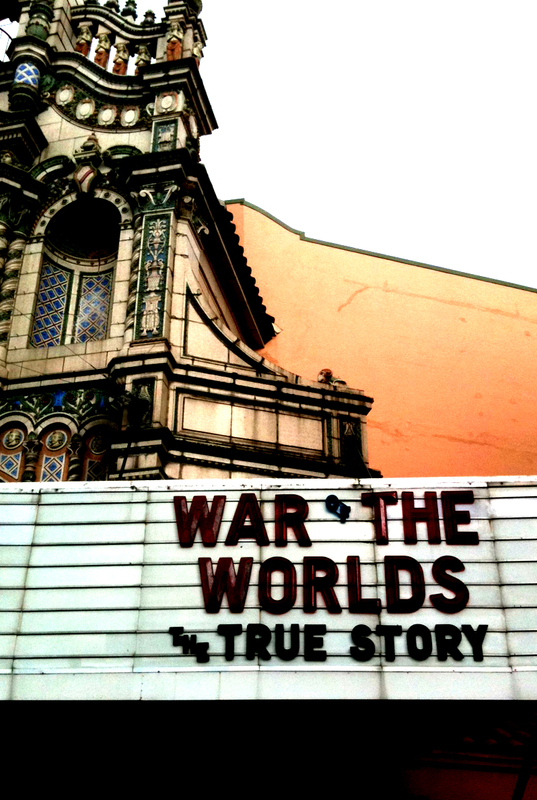 WAR OF THE WORLDS THE TRUE STORY adds Sacramento, California to its Theatrical Movie Release Dates. 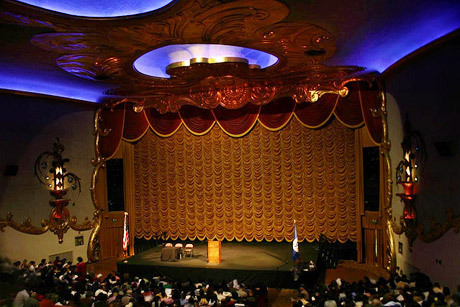 Martian Invasion of Sacramento's Crest Theatre on July 7th. 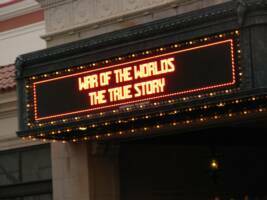 Pendragon Pictures announces that Sacramento California has been added to the theatrical movie exhibition dates of WAR OF THE WORLDS THE TRUE STORY. 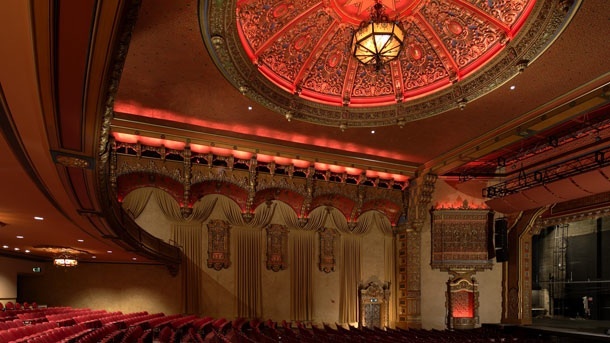 The movie will make its California premiere in a special engagement at the luxurious Crest Theatre on Saturday, July 7th at 3:30 and 8pm. 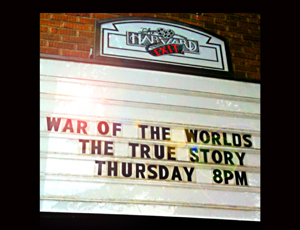 The US theatrical release of WAR OF THE WORLDS THE TRUE STORY has its world premiere at Landmark Theatres' Harvard Exit June 14 in Seattle. 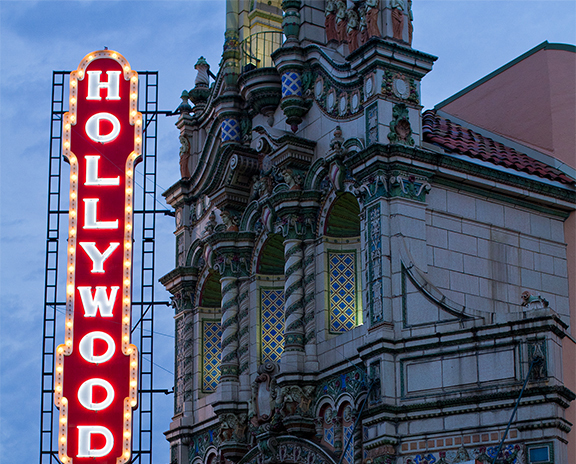 The limited engagement showings continue on June 22 in Bellingham, Washington at The Mount Baker Theatre, and June 21-24 in Portland Oregon at the Cinema 21 and The Hollywood Theatre. Then California, Arizona and New Mexico in July. 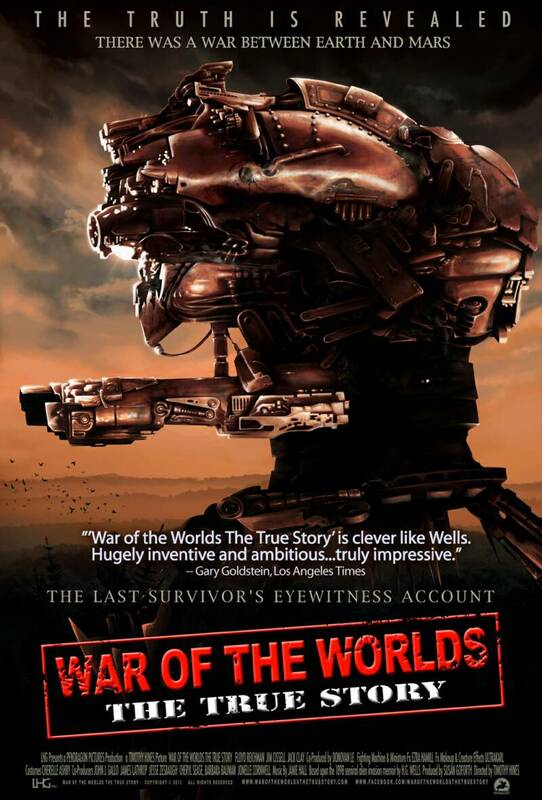 WAR OF THE WORLDS THE TRUE STORY is the eyewitness account of Bertie Wells, the last living survivor of the Earth/Mars War that took place in the year 1900. Bertie struggles to find his wife amidst the destruction of humankind at the hands of terrifying alien invaders. Using visual effects techniques pioneered in FORREST GUMP, WAR OF THE WORLDS THE TRUE STORY blends a modern cast with battalions of actual soldiers in combat, classic era movie stars, and declassified footage of tentacled alien creatures and their astonishing war machines. Based on the most beloved sci-fi novel of all time by H.G. 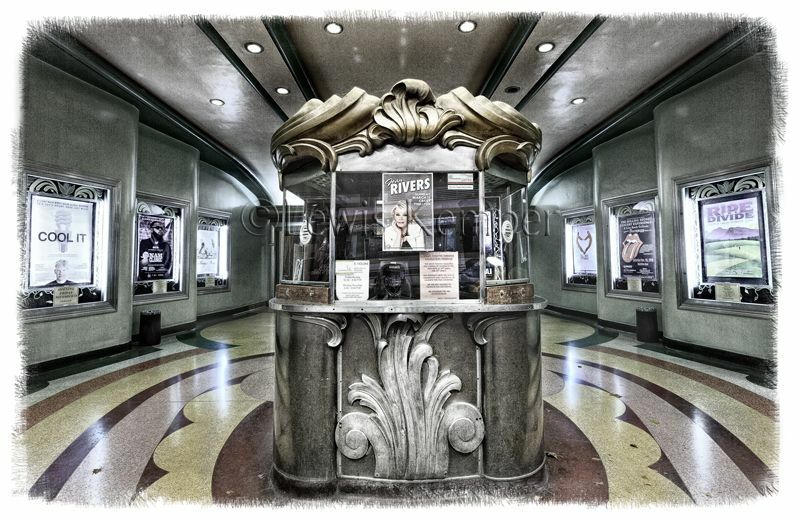 Wells, the movie is the result of a 15-year journey by Director Timothy Hines and Producers Donovan Le and Susan Goforth to bring the novel to the big screen. Starting as a $42-million production in 2001 with a Hollywood cast, the movie was shut down when the 9/11 attacks occurred. Now, triumphantly, this epic movie comes to theaters, capturing the original novel that terrified generations. When Timothy Hines and Susan Goforth began production of their sci-fi movie, “War of the Worlds,” they didn’t know they were about to play David to the Goliath that is Hollywood. Hines, a Port Townsend native and sci-fi fan since childhood, had long dreamed of filming the H.G. Wells story that Orson Welles made famous with his 1938 Halloween night radio broadcast. Some listeners who missed the disclaimer believed Martians were indeed invading Earth. Hines and Goforth, founders of Pendragon Pictures in Seattle, attracted some Microsoft money in the late 1990s, and the project was born. They had visions of “blowing up” the Space Needle in their film, and were working to line up stars like Michael Caine, Eric Stoltz and Charlize Theron. In 2005, director Timothy Hines did a War of the Worlds movie, the same year that Tom Cruise also did a War of the Worlds movie. He said he didn't like it, now he says he's calling a do-over. RevSF's Geek Curmudgeon Rick Klaw didn't like it, either. He said in his review, "Black and white gives way to color as the narrator finishes. Little did I know that it would all be downhill from there." Now Hines is doing a new version of the War of the Worlds story in War of the Worlds: The True Story. 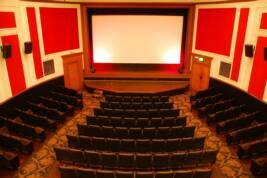 Here's movie site. It will look like a documentary, interviewing a survivor of the invasion, and showing archive footage. Producer Susan Goforth said in a press release, "People know there was no real Martian invasion a hundred years ago, right? So laying it out as if it were actual history is a lot of fun. And it hasn’t been done this way since that original Orson Welles broadcast." That really sounds neat. 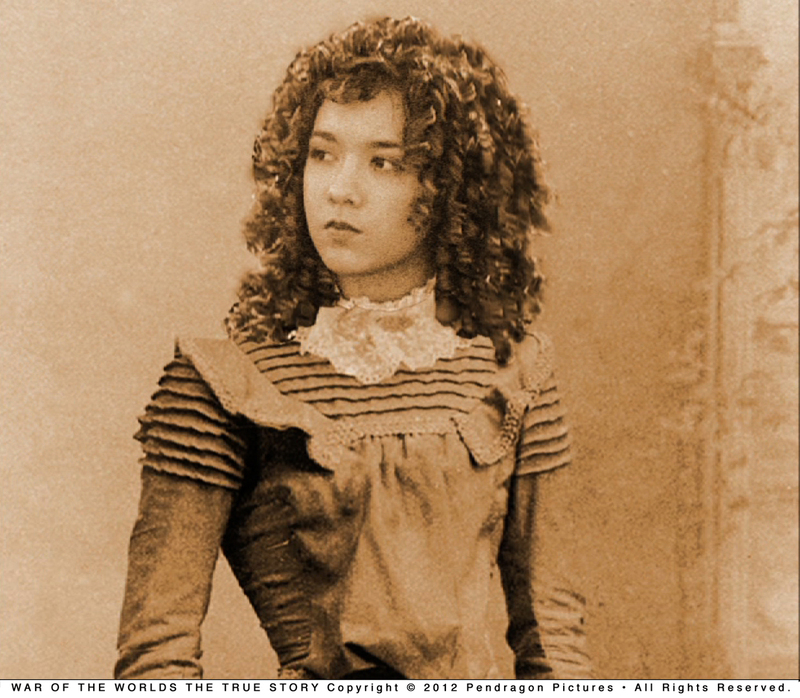 Of course, I thought a literal adaptation of the novel in a movie sounded neat, too. And so did Hines and Goforth, but they weren't happy with how the movie turned out. 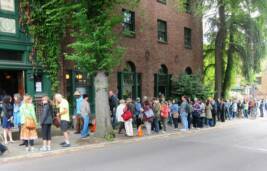 Seattle, WA – A new live-action movie based on H.G. Wells’ seminal science fiction alien invasion novel, The War of the Worlds, is in post production, it was announced today by Pendragon Pictures. The new movie, titled War of the Worlds – The True Story, has a planned release date of October 2010. 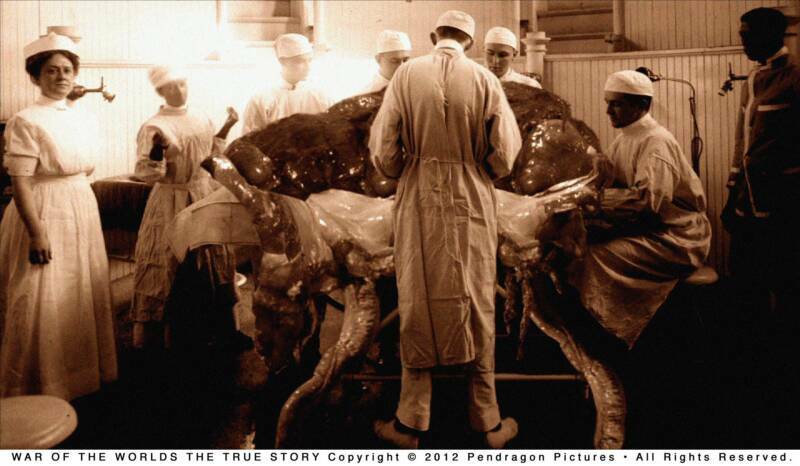 Pendragon Pictures have launched their movie tour for the U.S. and Canada 2012 for War of the Worlds The True Story, a sci-fi/horror mock-documentary adaptation of H.G. Wells’ alien invasion memoirs. The new movie was created as a faux documentary, similar to the 1938 Orson Welles CBS radio broadcast that terrified America, blurring the line between reality and fiction. In this piece, a 1965 film crew captured the memories of the last living survivor of the war between Earth and Mars that took place c1900. The filmed memoirs, discovered in a vault in 2006, were found with hours of previously unknown footage of the alien/Earth apocalypse, the actual Martian invaders and their terrifying machines of war. This is the motion picture presentation of that eyewitness account. Director Timothy Hines originally released a version of War of the Worlds in 2005. 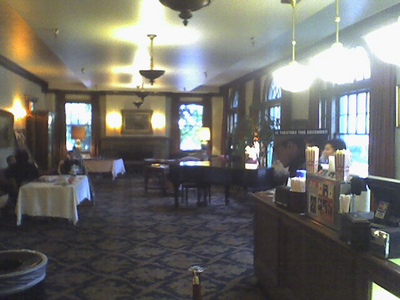 Though the 2005 picture grossed seven million dollars, out sold Taylor Swift’s first CD release and did one quarter of the X-Men sales in dvd, Hines told SFcrowsnest.com he considers it to be a disaster. “The 2005 film was both rushed and severely over-scaled with highly compressed post-production deadlines,” Hines told us. “The 2005 movie simply didn’t work,” added producer Susan Goforth. A new live-action movie based on H.G. Wells' seminal science fiction alien invasion novel, The War of the Worlds, is in post production, it was announced by Pendragon Pictures. 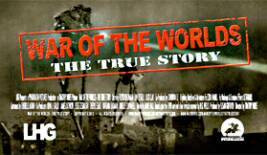 The new movie, titled War of the Worlds - The True Story, has a planned release date of October 2010. Pendragon producer Susan Goforth states, "This is a complete remake, not a re-working of our previous production." Under the direction of Timothy Hines, War of the Worlds - The True Story is being created as a faux documentary for television. Like the famous 1938 Orson Welles CBS radio broadcast of War of the Worlds, the new motion picture deliberately blurs the lines between reality and fiction. Timothy Hines talks about the new story approach, "When Orson Welles broadcast War of the Worlds on the radio in the 30s, he presented it in such a way as to not clearly identify that it was a work of fiction. He did it for the drama. And many people took the fictional news broadcast as a real news broadcast. People believed they were hearing an actual invasion from Mars that night. We are approaching the story in the same way, as if it were an actual news documentary." 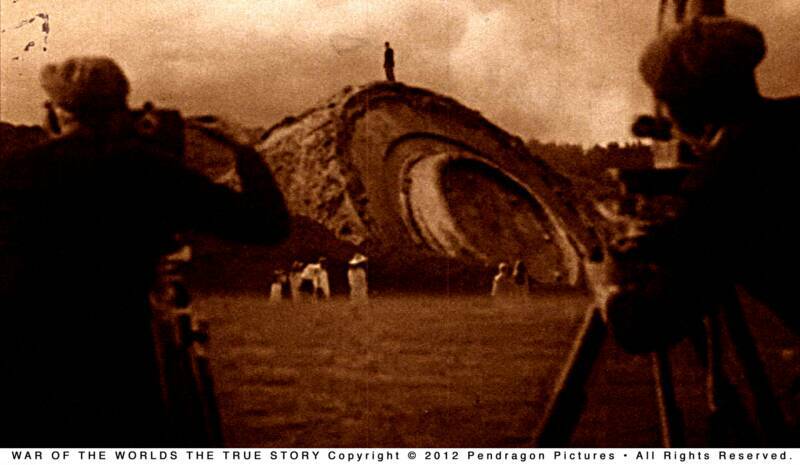 A 1965 film crew captured the memories of the last living survivor of the war between Earth and Mars that took place c1900. The filmed memoirs, discovered in a vault in 2006, were found with hours of previously unknown footage of the alien/Earth apocalypse, the actual Martian invaders and their war machines. This is the motion picture presentation of that eyewitness account. 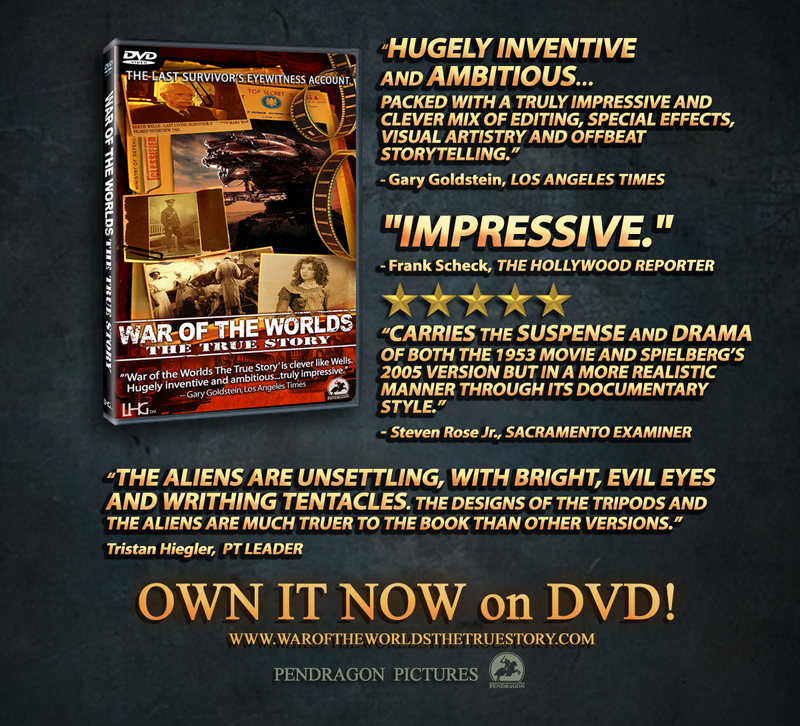 SEATTLE, WA -- Pendragon Pictures announces the release of WAR OF THE WORLDS THE TRUE STORY onto US DVD, a critically acclaimed Oscar contender featuring epic battles, giant robotic walking war machines, heat-ray weapons, frightening alien creatures, human loss, love and the triumph of spirit. Years before Spielberg’s production of War of the Worlds, in 2001, another large budget movie of the H.G. Wells story was in the works by director Timothy Hines. With a budget of $42 million and in negotiation with Charlize Theron and Michael Caine to star, the movie was abruptly halted along with a slew of action driven Hollywood pictures when the 9-11 terrorist attack occurred. 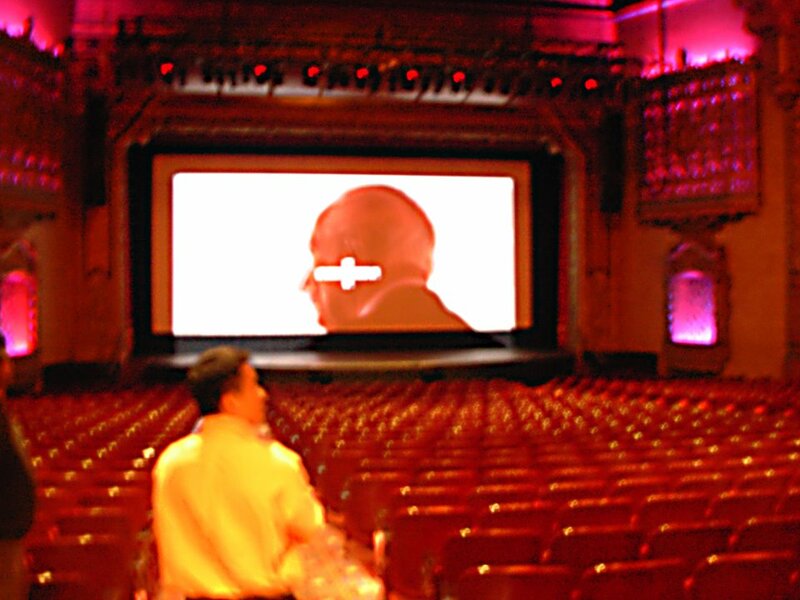 Following the shutdown, Director Timothy Hines and producer partners Susan Goforth and Donovan Le spent more than a decade to remount the movie and bring their unique epic version of the H.G. Wells classic to the screen.. 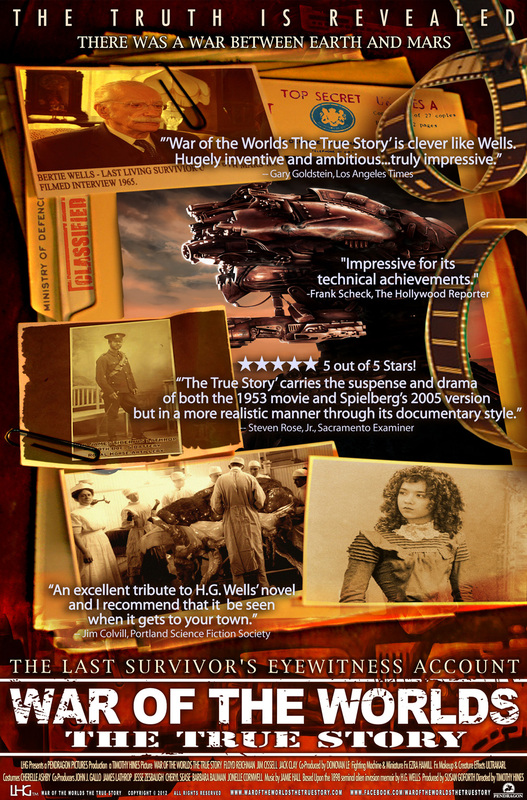 Entire Story..
On DVD right now is the acclaimed mockumentary War of the Worlds: The True Story from director Timothy Hines.. 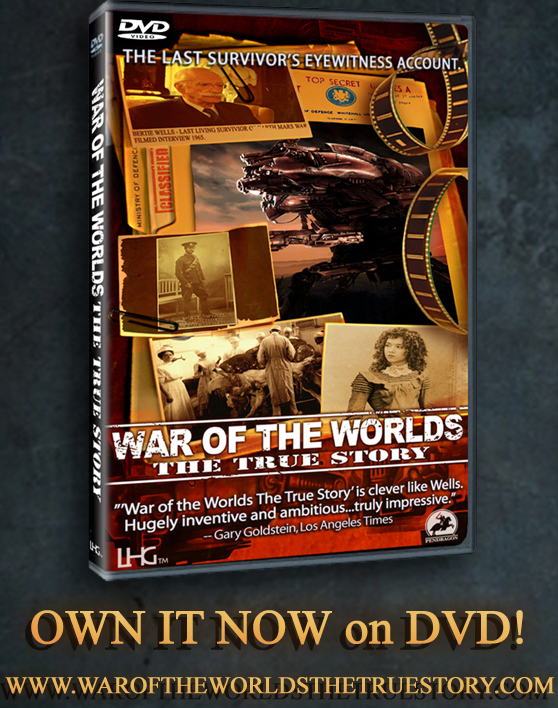 Entire Story..
WAR OF THE WORLDS THE TRUE STORY follows the eyewitness account of Bertie Wells, the last living survivor of the Earth/Mars War that took place in the year 1900, as he struggles to find his wife amidst the destruction of humankind at the hands of terrifying alien invaders. 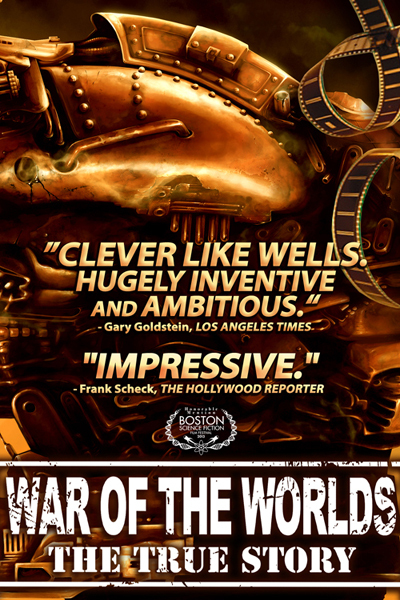 Like FORREST GUMP, WAR OF THE WORLDS THE TRUE STORY uses cutting-edge visual effects to blend a modern cast with battalions of actual fighting soldiers, golden age movie stars, and previously undisclosed images of tentacled alien creatures and their monstrous machines of war. 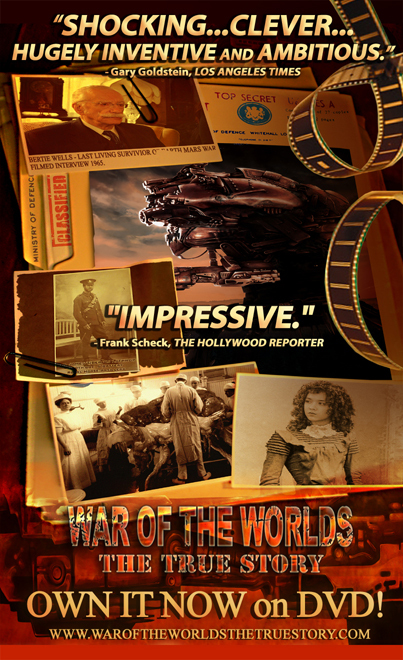 Entire Story..
Pendragon Pictures announces the June theatrical release of "War of the Worlds - The True Story." It's true, I have a soft spot in my heart for War of the Worlds, everything about it. I fell in love with the original Orson Wells radio broadcast when my father introduced it to me as a kid. The 1953 movie, the book (of course), the horribly underrated TV series- I even enjoyed the 2005 Steven Spielberg effort (despite the many shortcomings). The real aura and magic come from the original broadcast, though, the first inklings of the "mockumentary" and what would become cinema-verité. It's in that spirit that Timothy Hines set out to make his own take on the War of the Worlds story. Here's where it gets confusing however. Timothy Hines made a version of the story in 2005 for Pendragon Pictures, but he was never happy with the finished product. 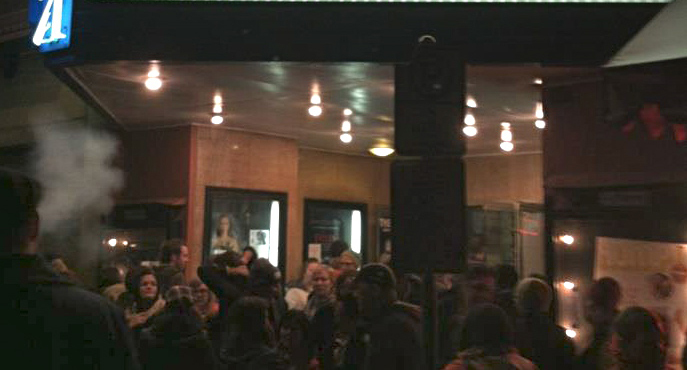 When speaking to SFCrowsnest.com Hines stated, “The 2005 film was both rushed and severely over-scaled with highly compressed post-production deadlines”. With that in mind Hines has created a remake/addendum to his first effort, this time titled War of the Worlds: The True Story (also for Pendragon Pictures). 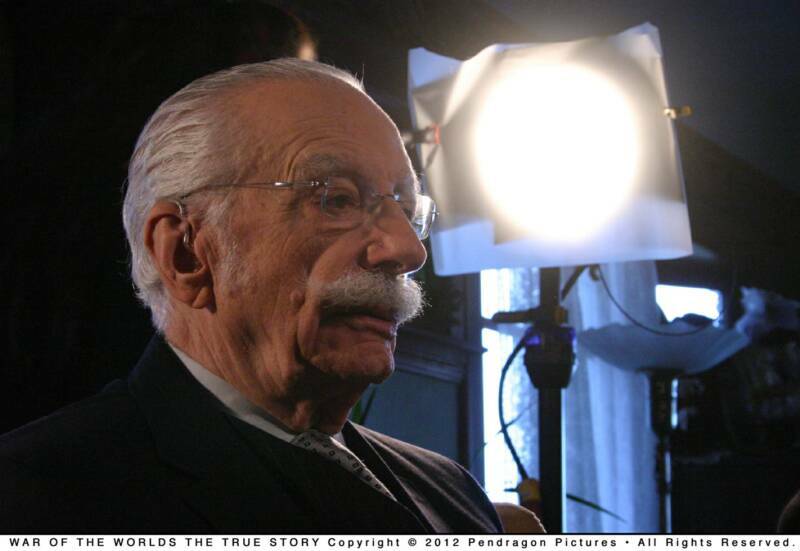 Shot as a documentary, The True Story focuses on a 1965 interview with the last living survivor of the war between Earth and Mars that took place in 1900. Using documentary tools such as re-enactments, found footage and interviews, War of the Worlds: The True Story looks to create a History Channel style look back at the bloody war that could have been. CLICK HERE TO SEE THE NEW TV SPOT!